Bastide Belvèze-du-Razes is a luxurious country villa, beautifully located in 1.5 acres of land in the sought-after Languedoc. Offering stunning panoramic views of the surrounding vineyards and fields, this villa is perfectly secluded and quiet. The interior of the Bastide is beautifully and modernly designed, offering comfort and beauty for all those who vacation here. With a private swimming pool and 6 bedrooms, this property is perfect for a group of 12. If you dream of spending some time away from it all, but with all the comforts of the most modern furniture and fittings - then look no further! Bastide Bellegarde is a country style villa in the south of France with a private pool and 7000 m2 of private land with stunning views of the surrounding vineyards and the Pyrenee mountains. The spacious interior of this property is newly decorated in an elegant, contemporary and natural style. There is a large living area with an integrated kitchen and a modern dining room with views of the garden and vineyards. The house is set over 2 floors, with 2 bedrooms on the ground floor that include en-suite bathrooms and walk-in showers, and 4 bedrooms on the 1st floor. The bedrooms are spacious with views across the countryside, vineyards and Pyrenee mountains. 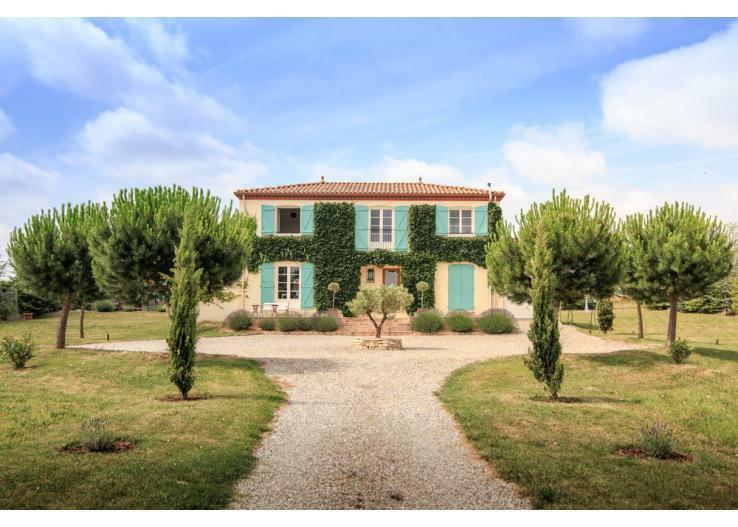 Bastide Bellegarde is surrounded by vineyards and fields in a secluded, quiet location. The 7000 m2 grounds are beautiful, with lawn and trees overlooking the mountains and vineyards. Great pool among the vineyards and sunflower fields - big and secure, with natural shade and modern sun loungers. The terrace is 50 m2 with furniture and deck chairs for up to 12 adults and 6 children. The large 10m x 5m Pool is fenced and has natural shade. The house comprises 6 bedrooms, 4 bathrooms (3 en-suite), a large double living-room and dining room and spacious kitchen. On the ground floor there are two double bedrooms with en-suite bathrooms and their own terrace. There is an open kitchen with a traditional six hotplates range cooker, dishwasher, microwave, and an American fridge serving crushed ice and water. The lounge area is spacious with satellite flat screen TV, sound system, free Wi-Fi and comfortable seating. The dining room is modern with views across the garden. The terrace is accessible via 3 double doors. The first floor offers two large double bedrooms and two twin bedrooms (which can be converted into large double bedrooms), one en-suite bathroom and one bathroom with contemporary standing bath and walk-in shower. Views across the country, vineyards and mountains from all the bedrooms. Facilities include: internet access, private outdoor pool, air conditioning, TV, DVD player, satellite TV and WiFi. Bastide Bellegarde is situated in the heart of the Cathar country, 30km south of Carcassonne, 100km from Toulouse and 100km from the Mediterranean coast. The nearest village is Belveze-du-Razes (3 km). Guests can enjoy golf at Domaine d'Auriac in Carcassonne, and skiing at Mont d'Olmes, which is 50km away. The nearest railway station is Limoux. The nearest airport is in Carcassonne (CCF) (25km). Alternatively, Toulouse-Blagnac Airport (TLS) is 93km away. The Department of the Aude boasts two UNESCO listed landmarks: the fortified city of Carcassonne and the Canal du Midi. The Aude hosts 100 km out of the impressive 235km length of the Canal du Midi. Guests can enjoy exceptional architecture in the local area, with several medieval castles in what has come to be known as 'Cathar Country'. Catharism was a dissident sect that flourished in the Languedoc in the 13th century. The Albigensian Crusade was created to subdue and eventually eradicate the Cathars which it succeeded in doing by such cruel and bloodthirsty methods that by the 14th century the sect had effectively perished. However, its legacy lives on in castles such as Peyrepertuse, Quéribus and Villerouge, usually perched on apparently inaccessible rock outcrops and now open to the public. Hire a boat and enjoy a slow journey down the Canal du Midi to the local town. The greenery provides a beautiful backdrop to the birds and wildlife. The Languedoc is one of France’s sunniest areas, with fine sandy beaches and seaside resorts including: Narbonne-Plage, La Palme and Port La Nouvelle. Of the 3,000km of designated hiking paths in the Aude, the 200km Cathar Trail, which runs from the Mediterranean to the Pyrénées, is highly recommended. Discover a wide variety of landscapes with a number of medieval castles appearing along the way. The coastline of Narbonne is one of the best windsurfing spots in the world, and offers excellent conditions for kite surfers and kite flying. One of the largest local markets is in Carcassonne, held on Tuesday, Thursday and Saturday mornings at Place Carnot in the town centre. Castelnaudary has a food market on Monday morning and the market at Lézignan-Corbières takes place in the centre of the commune on Wednesday mornings. Visit Limoux on a Friday for more fresh local produce. All linen and bath towels included. You are better off with a car (or bikes) to get to the nearest village which is 3kms away. It can get quite windy in the region, but this counts as a benefit during the hot summer months. Maid service and babysitting service available (at extra cost).